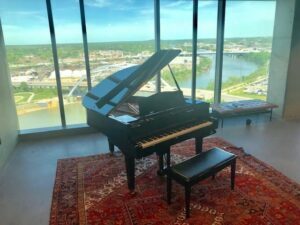 You are here: Home / What is a Hybrid Piano? 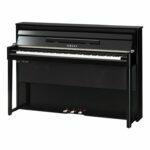 Currently the only manufacturer of hybrid pianos is Yamaha. My favorite example of a hybrid piano is the Avant Grand N-3. Yamaha also makes an N1 and N-2 (and an NU1) but for the sake of explaining what we mean by a hybrid I’ll use the N-3 as my example. 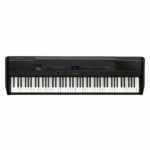 The N-3 Avant Grand is neither an acoustic or digital piano. It is a little of both, but truly neither. Through the marriage of tradition and technology the Avant Grand delivers an instrument which feels and responds exactly like an acoustic grand piano without the issues of space limitation, maintenance, and the higher budgets associated with buying a traditional grand piano. What did I say?… without the limitations of maintenance? Reading between the lines maybe you have guessed that it stays in tune. That’s correct you don’t have to have this piano tuned. How does the N3 accomplish the touch and feel of a grand piano? Simple, it actually has a grand piano keyboard! This part of the Avant construction IS, it doesn’t duplicate or replicate, it IS the same part that is used in a conservatory series grand piano! It feels the same because it is the same, including the patented ivorite key tops. 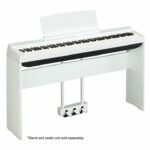 Why would Yamaha be inspired to create a hybrid piano? One reason is that they never quit pushing the boundaries because of their commitment to research and development. Even during the economic downturn which has been evident globally, the world’s largest builder of musical instruments stayed true to their mission to find advanced solutions for today’s music lover. Their commitment to research and development is an ingrained part of their business model. To be pragmatic about it, they believe, as I heard a Texas businessman say one time, “If you’re standing still, you’re backing up!” It is a part of their business DNA. Another reason they wanted to create hybrids is because it is a great accomplishment to build an instrument which sounds, feels, and responds like a grand piano without the demands of space a grand piano commands. A third reason would be the elimination of constant maintenance. The Avant is practically maintenance free. It may require a regulation from time to time for the most discerning players but other than that it just plays and plays (in tune) without that extra regular cost. The Avant Grand by design is made to give the player the vibrations and sound experience they get from a traditional grand piano. How? The spatial acoustic sampling is delivered to the player by state of the art speakers strategically placed to provide the same feel and sound experience of the grand piano, which is its inspiration. The speakers aren’t designed solely for the listenerbut the player as well. An inspired experience will serve both the pianist and the listener and is the solid musical logic behind spending so much time in the choice and placement of the speakers. The soundboard resonator is also a part of delivering this experience. The Avant Grand also gives the player the traditional grand experience with its addition of the special grand piano pedal mechanism. True to the capabilities of the digitals Yamaha has built, the Avant sports some really fun and practical electronic capabilities such as onboard recording and playback. You can also save and share your work with an inexpensive thumb drive. True to its communications versatility the Avant connectivity also includes MIDI, Aux in, and Aux out. The Avant Grand allows you to choose the piano sound you prefer depending on what you are playing and wanting to hear. The sound options even include a harpsichord sample. 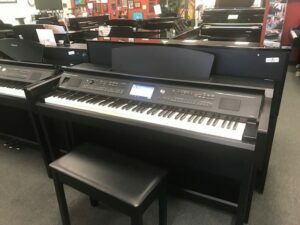 To summarize, the Yamaha Avant Grand series consists of the N3, which is the largest of the three N series instruments, but it also is available in more upright appearing designs which make them even more appropriate in smaller spaces. Who would have ever thought you could have a grand piano experience by sitting down to an upright sized instrument? 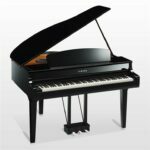 Yamaha has done it again, gone where no other piano builder has ever gone! They are the “Star Ship Enterprise” of the manufacturing world. 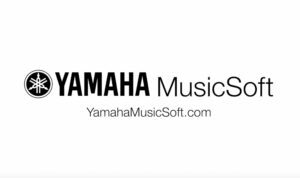 The applications for home, church, and school use are very exciting so we whole-heartedly encourage you to experience Yamaha’s newest marriage between tradition and technology. It is a true musical marvel.